Not quite in the top 10 of all time quotes but it meant a lot to me. Why? Because it was said by my 10 year old daughter, Ruby, as we celebrated Father’s Day yesterday in Walton on the Naze. Being a father is very special. I don’t need a named day to know that, but nevertheless having your two kids attempting to spoil you rotten (until they get bored) is never a bad thing. But it comes with challenges. In previous years I have had to swallow a concoction of fruit juices with other ingredients found in the kitchen, and with a smile on my face! Lunch made by two young children who don’t quite know what works on a plate (or doesn’t) forces an even bigger smile. But knowing you are loved for who you are (and what you look like) is priceless. And so back to Ruby’s quote. If you are going to change the disability conversation it will be the current young generation that will lead the charge. The funny thing is they won’t even know what they’ve achieved because for them it will all just be normal. As a disabled father, I have experienced many looks and the odd (misguided) comment. But never from children. They say it as they see it, and are then very accepting when you tell them the answer to their questions. Why are you so short; why do you have no arms; why do you walk a little bit like a penguin? I always explain I was born that way because some people are; I don’t have arms but I’m not sure I actually need them; and, as for the penguin, it is very hard not to simply agree with them! At which point they laugh and move on. And they do move on. Those questions all came from my son Daniel’s classmates (they are all 4/5) earlier this year. And to keep the animal analogy going, they now don’t bat an eye lid. When another child asks (at say, a birthday party), they just jump in before Daniel and say ‘that’s Daniel’s Dad’. The same experience happened with Ruby’s class about five years ago. If I think quite hard I probably don’t get many looks now in the entire school. I am Ruby and Daniel’s dad. Full stop. I heard Ruby say to another child the other day. ‘My dad was disabled before it was popular’. I was impressed. Impressed because she was reciting a line from Lost Voice Guy on Britain’s Got Talent, and because she delivered it with, nearly, comic timing! But disability is starting to become normal and people like Lost Voice Guy will simply accelerate this normalisation. As issues of disability get more exposure, in all walks of life, then increasingly it becomes a non-issue. And that will be a real measure of success. To my kids, I am simply ‘Daddy’. Their Daddy looks a little different to their friends Daddys, but to them that is just how it is, and they wouldn’t change it. 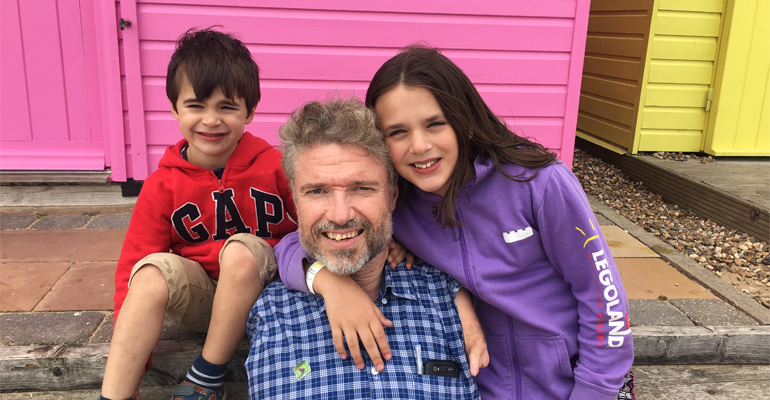 We talk openly about disability, and they also understand the importance of accessible features as they see me being ‘enabled’ as their Daddy. My son Daniel will now point out the Blue Badge parking bays and the push buttons for doors with the wheelchair symbol – he runs ahead to push the button and will say ’Daddy I opened your door for you’ – disability is simply part of his world. In many ways, I think they see having a disabled Daddy as a badge of pride, and certainly not as a negative. This was probably best shown by my Father’s Day card this year from Ruby – she has drawn me as a superhero, flying through the sky with a cape. The badge on my chest? The wheelchair symbol which she now recognises as the sign for disability. She said ‘Daddy, you’re a superhero and your super power is being disabled’.